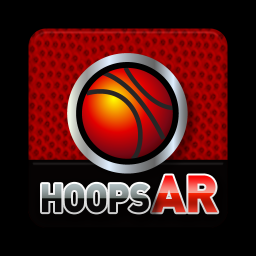 Earlier today, a tip about a new augmented reality game called HoopsAR hit our inbox. Since augmented reality is a relatively new and kind of cool subject, I decided to take a deeper look and go hands-on. Before I could play the game, I needed to print out a basketball "ticket" which serves as the game board. The phone's camera then scans it and overlays the court on top of it in 3D. If you're still a bit confused about how it works, don't worry - I whipped up a quick video hands-on in order to explain the overlay function and simple controls that make this game worth checking out. HoopsAR is powered by Qualcomm's Mobile Augmented Reality Platform, which allows all this wizardry to take place. It isn't as impressive as some applications that we've seen, but I'll give it credit for trying. Interestingly enough, there's also a Dallas Mavericks-branded version of this app which is available on the actual Mavericks' playoff tickets, except instead of using the printout, you'd use the stub from what you get into the game with. Whether you find these games useful or not, you have to admit - what you've seen above is worth checking out for the pretty cool AR experience.